Objective To investigate which of two commonly used treatment protocols for exercise-associated postural hypotension (EAPH) resulted in earlier discharge from the medical facility. Methods This randomised clinical field trial was undertaken at two Ironman Triathlon competitions and one ultra-distance footrace. All collapsed athletes admitted to the medical facilities were considered for the trial. Following clinical assessment and special investigations to confirm the diagnosis of EAPH, 28 athletes were randomly assigned to an oral fluid and Trendelenburg position (OT=14) or an intravenous fluid (IV=14) treatment group. Following admission fluid intake was recorded, and all athletes were assessed clinically (blood pressure, heart rate, level of consciousness) every 15 min until discharge criteria were met. The main measure of outcome was the time to discharge (min). Results On admission, subjects in the OT and IV groups were similar with respect to age, systolic blood pressure, heart rate and serum sodium concentration. There were no significant differences in heart rate, systolic and diastolic blood pressure between groups and over time until discharge. The fluid intake during the treatment period was significantly greater in the IV group (IV 1045±185 ml, OT 204±149 ml; p<0.001). The average time to discharge for the OT group (58±23 min) was similar to that of the IV group (52.5±18 min; p=0.47). Conclusion Endurance athletes with EAPH can be treated effectively using the Trendelenburg position and oral fluids and the administration of intravenous fluids does not reduce the time to discharge. The findings of this study support the hypothesis that EAPH is a result of venous pooling due to peripheral vasodilatation, rather than dehydration. There appears to be a perception that athletes with EAPH recover quicker and are discharged earlier if treated with intravenous fluids, when compared with treating the athlete in the Trendelenburg position and administering oral fluids freely. However, to our knowledge, no controlled trials have investigated these two treatment protocols for EAPH in a systematic manner. In particular, no randomised clinical trials have compared these two treatment protocols in athletes with EAPH. Therefore, the aim of this study was to compare which of the two commonly used treatment protocols for EAPH (Trendelenburg with freely available oral fluids or intravenous fluids) resulted in more rapid recovery and earlier discharge from the medical facility. The study was conducted as a randomised clinical trial and the setting was that of a field trial. Subjects were recruited for this study from three ultra-endurance events, the 2006 and the 2007 South African Ironman Triathlon, and the 2006 Comrades ultramarathon. From these events, all the athletes who collapsed due to EAPH were considered potential subjects for this clinical field trial. The general methodology used to recruit subjects at these three events was similar and consisted of the following steps: pre-race athlete information, setting up research facilities in the medical tents that were integrated with the normal medical care facilities, informing all medical staff in the medical tents before the race of the nature of the study and the inclusion criteria for subjects, screening athletes in the triage area, and identifying athletes with EAPH using defined inclusion criteria as potential subjects, and obtaining informed consent from athletes with EAPH. Pre-race information about the study, including the purpose of the research and the methods, was available on the relevant race websites and was also provided during race registration. With agreement of the race medical directors, the protocols used were integrated with the race medical facilities. The medical staff where briefed on the protocols before the event. Recruitment of the athletes took place on admission to the medical tent. This was done with the agreement of the race medical directors of all the events. As both treatment protocols are current medically acceptable protocols for the management of this condition, the race medical directors were satisfied that adequate medical care would still be provided by medical staff, irrespective of the protocol used. According to standard medical protocol, all athletes who presented with collapse at the medical facilities were placed in the supine position and an immediate baseline clinical assessment was completed by the attending medical staff. This assessment was designed to establish a diagnosis and identify any patient who may be severely ill and who may require urgent medical treatment. A diagnosis of EAPH was only confirmed once the following specific inclusion criteria were satisfied: (1) inability to stand or walk unaided after finishing the race (not during the race) as a result of light-headedness, faintness, dizziness or syncope; (2) normal level of consciousness and oriented; (3) systolic blood pressure greater than 100 mm Hg; (4) heart rate less than 100 bpm and (5) body temperature less than 40°C. The level of consciousness and orientation was assessed based on the following questions: (1) what is your name; (2) how old are you; (3) what is the date; (4) what race have you just completed and (5) where are you? If possible, a post-race body weight was obtained during this initial assessment. The process of obtaining informed consent did not result in a delay of the treatment of these athletes. Consent was obtained on admission and confirmed again on discharge. Before the study, the protocol was approved by the Research Ethics Committee of the Faculty of Health Sciences at the University of Cape Town (ref numbers 425/2005, 185/2005 and 002/2007). Once athletes were included in the study, members of the medical research team continued the management of these athletes. Thirty-two athletes (26 men and six women) were initially included in the trial. Once athletes were entered into the trial, the following baseline medical assessment information was recorded: level of consciousness, heart rate and supine blood pressure. In addition, a venous blood sample was obtained to determine the blood glucose and serum sodium concentrations. Subjects were only included in the clinical trial if their serum sodium concentration was normal (135–148 mmol/l). The athletes were then randomly assigned to a treatment protocol based on the last digit of their race number. Athletes with odd race numbers were recruited for the oral fluid and Trendelenburg position (OT) treatment protocol, which consisted of the following treatment details: (1) insertion of a venflon with the infusion of 50 ml normal saline over 1 h; (2) measurement of serum sodium concentration; (3) raising the athlete's legs and buttocks to 30° and (4) advising the athlete that he or she may drink as much as desired. Athletes with even race numbers were recruited for the intravenous treatment protocol (IV), which consisted of the following treatment details: (1) insertion of a venflon with the infusion of 1000 ml normal saline over 30 min; (2) measurement of serum sodium concentrations; (3) the athletes remained in the supine position and (4) were advised that they may not drink during treatment. All fluid input was measured and documented in both groups. Clinical re-assessments (level of consciousness, heart rate, supine blood pressure) were conducted every 15 min in both groups until discharge. Any athletes who had a change in these parameters had a repeat serum sodium concentration taken. Athletes were excluded from the study if their serum [Na+] dropped below 135 mmol/l. The treatment of the athletes who were removed from the trial was then taken over by the medical staff in the race medical tent. The reason for transfer from the trial was documented. The primary endpoint for the clinical trial was discharge from the medical facility. At each 15 min interval, athletes were assessed for their eligibility for discharge from the medical facility. The criteria for discharge were: (1) normal mental state and (2) the athlete was able to stand and walk unassisted for 5 m. The time of discharge (min) was recorded, and this was the main measure of outcome. If an athlete requested discharge, they were counselled and if they insisted, this was noted and they were discharged. Four athletes were removed from the trial: one due to hypoglycaemia; one became confused and developed hyponatremia after 15 min while on the intravenous drip; one subject was randomly assigned to the oral trial but requested intravenous fluid after 30 min and one did not respond to 1000 ml of intravenous fluids after 30 min. The subject whp developed hyponatremia while receiving intravenous fluid was a 49-year-old woman who presented with a serum [Na+] of 136 mmol/l on admission. After 15 min on the intravenous treatment (receiving approximately 500 ml fluid) she became confused and her serum [Na+] had decreased to 134 mmol/l. According to the protocol, she was then removed from the trial and transferred to the high-care medical treatment area. Of the final 28 athletes who completed the trial, 14 athletes were randomly assigned into the OT group (Trendelenburg and oral fluids) and 14 athletes were randomly assigned into the IV trial group (intravenous fluid). The main outcome measure for this study was time to discharge from the medical tent (min). Additional measures of outcome were heart rate and blood pressure changes over time. Data were analysed with the STATISTICA version 7.0 statistical program. Any significant differences between the groups were determined by a one-way analysis of variance or χ2 analysis. When the overall F-value was significant, a Tukey's honest significance post-hoc test was used to determine specific differences. Statistical significance was accepted when p<0.05. The age (mean±SD) of the athletes in the OT group (n=14) was 37.7±7.2 years and that for the IV group (n=14) was 36.5±7.1 years. There was no significant difference between the ages of the two groups (p=0.66). All the athletes were weighed on the morning of the race as they entered the transition zone. There were no significant differences in the pre-race weights (OT 73.6±8.1 kg (n=7) vs IV 76.0±6.2 kg (n=5); p=0.59) or gender distributions (OT 78.6% men vs IV 92.9% men; p=0.60) between the two groups. The temperature, humidity and wind speeds for the three events were similar (table 1). There were no significant differences in the blood pressures, heart rates, axillary temperatures, serum [Na+] and plasma [glucose] of the athletes in the two protocol groups on admission to the medical facility following EAPH (table 2). Pre-race and post-race body weights were obtained for 10 athletes (OT N=6; IV N=4). There were no significant differences in the absolute (data not shown) and relative pre–post-race body weight changes (table 2) of the athletes between the two groups on admission. Weight changes ranged from a weight loss of 4.9 kg to a weight gain of 3.4 kg in these athletes. One athlete in each group had an increase in body weight after the race (OT 1.7% and IV 5.1%). The rest of the athletes lost weight during the race. The greatest loss was 5.2% of pre-race weight, and this athlete, who was randomly assigned to the oral protocol, was discharged after 35 min. There were no significant differences in supine systolic and diastolic blood pressure and heart rate between the 28 athletes in the two groups or over the 15 min recovery periods (table 3). The number of athletes remaining after each 15 min recovery period is also indicated in table 3. The admission and final blood pressure and heart rate data of the athletes in the OT and IV protocol groups, respectively, are depicted in figure 1. The discharge values are the last recorded vital signs before discharge and are therefore not necessarily recorded at the same time for each athlete. There were no significant differences in the changes in systolic blood pressure, diastolic blood pressure and heart rate from admission to discharge between the two groups. 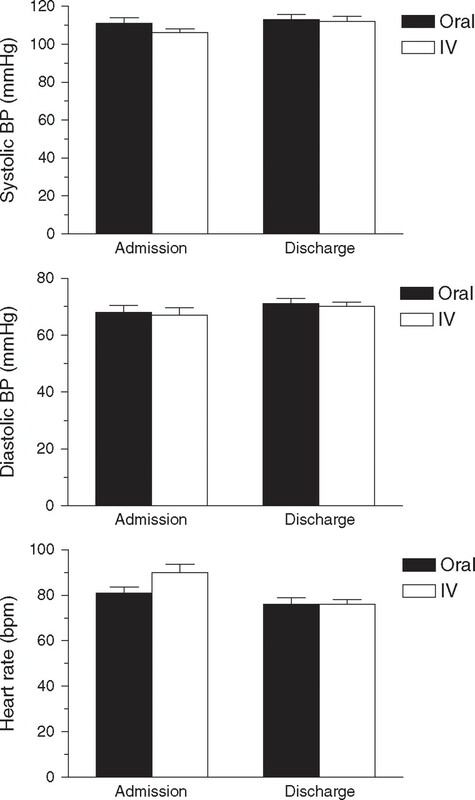 Comparison of supine systolic blood pressure (BP) (top panel), diastolic BP (middle panel), and heart rate on admission and discharge between the oral fluid and Trendelenburg position (oral) and intravenous fluid (IV) groups. As shown in figure 2, the total volume of fluid (ml) (mean±SD) received by the OT group was 204±149 ml (n=11), and this was significantly less that that received by the IV group 1045±185 ml (n=12; p<0.001). Data on fluid administration were incomplete in five patients. Volume of fluid the oral fluid and Trendelenburg position (oral) treatment group drank compared with the volume of intravenous fluid the intravenous fluid (IV) treatment group received while in the medical tent. There was no significant difference in the time to discharge between the athletes in the IV group (52.5±18 min) compared with those in the OT group (58±23 min; p=0.47) (figure 3). Time to discharge in the oral fluid and Trendelenburg position (oral) compares with the intravenous fluid (IV) treatment group. The main finding of this study was that the time to discharge of athletes with EAPH is similar when treated with either intravenous fluids or when placed in the Trendelenburg position and given oral fluids freely. The results of this study showed no difference in the time to recovery between the two protocols. This suggests that, in these athletes, raising the limbs in the Trendelenburg position is sufficient to restore plasma volume rather than by the rapid infusion of intravenous fluids. In this trial, athletes who received intravenous fluids were given on average five times as much fluid during their recovery period, yet did not recover more quickly than the oral group. The results of this study therefore show that athletes with EAPH do not require intravenous fluid rehydration, but will respond as rapidly to treatment consisting of minimal oral fluid and raising the lower limbs (Trendelenburg position). Athletes with EAPH can adequately replace any fluid orally, provided they do not have any gastrointestinal disturbance, or cannot consume fluid for any other reason. The results of this study therefore support the hypothesis that EAPH is caused by pooling of blood in the lower limbs on completion of exercise. Finally, the possible role of the histamine receptors, H1 and H2, in post-exercise hypotension has recently been suggested.30 31 In both studies the ingestion of antihistamines before exercise decreased the extent of post-exercise postural hypotension.30 31 From the results of the two studies, it was concluded that histamine, by means of its stimulation of H1 and H2 receptors, may play a role in preventing the development of postural hypotension. The results of those studies also suggested that stimulation of H1 receptors may cause hypotension in the first 30 min post-exercise, whereas activation of H2 receptors has been shown to cause hypotension between 30 and 60 min post-exercise. The other major criteria for excluding subjects from this study were a temperature greater than 40°C (heat stroke), a blood glucose concentration less than 4 mmol/l (hypoglycaemia) and a serum sodium concentration less than 135 or greater than 148 mmol/l (dysnatraemia). The other exclusion criteria were a heart rate greater than 100 bpm and a systolic blood pressure less than 100 mm Hg. Although these clinical signs may be present in an athlete with severe collapse, there is no evidence that these specific cut-off points distinguish more serious pathology from less serious pathology. For example, it is probable that blood pressure on standing was likely to have been very low and this could cause dizziness or syncope. Furthermore, blood pressure measured in the supine position may not reflect the extent of the blood pressure fall on standing. However, due to the nature of the trial, data on pre-race and post-race body weight could not be collected from all the subjects. This is a limitation of the study. A further limitation of the study was that it was not possible to document the pre-race blood pressure and heart rates. However, these vital signs, which were measured on admission to the medical tent, show that these athletes generally had a low blood pressure, and this is in keeping with findings reported from previous studies that have documented post-exercise hypotension.2 17 32,–,34 The average heart rate of the athletes in both groups on admission was slightly elevated (81 bpm for OT and 90 bpm for IV groups) but was not different between groups. The serum sodium concentrations and blood glucose concentrations of the athletes in both groups were within the normal range throughout the study, as abnormalities in these parameters were exclusion criteria. The final limitation of this study was the small sample size. The reason for the small sample size was the difficult nature of the study. This study required careful planning and support from race organisers and medical staff. Furthermore, it was not possible to predict accurately the number of athletes who would collapse at events and would then be eligible for the trial. It therefore took three major events to obtain an adequate sample size for the study. The time to discharge of the athletes is of interest to medical staff providing medical care at these events. In this study, 19 of 24 athletes were discharged within 60 min after admission—nine of 12 from the group who received oral fluids and 10 of 12 from the group given intravenous fluid. In this study, blood pressure remained stable over time and there was a small (not significant) decrease in heart rate over time during recovery. The comparison between admission and discharge blood pressure and heart rates showed that there was no significant difference during recovery in any of these vital signs between the two protocols. The discharge vital signs are the last recorded vital signs before discharge and thus are not recorded at the same time for each patient. Finally, it is important to point out that there are no scientific criteria that justified the selection of criteria for discharge in this study—these were, however, based on the experiential evidence of sports physicians treating endurance athletes. In summary, the result of this study show that time to discharge following EAPH is the same whether an athlete is given a large volume of intravenous fluid or is treated in the Trendelenburg position and given small volumes of oral fluids. These findings suggest that the cause of EAPH is not due to volume depletion (dehydration) but rather to venous pooling of blood in the lower limbs upon cessation of exercise. We also note that vital signs in the supine position did not change during the trials, whereas the ability to stand unaided improved progressively. This component of recovery is clearly not detectable when subjects are examined only in the lying position. One of the most common clinical presentations during and following an endurance event is that of the ‘collapsed’ athlete. The most common cause for collapse is a condition referred to as EAPH. However, there is no clarity on how best to treat athletes with EAPH. The two protocols that are commonly used to manage athletes with EAPH in race medical facilities are intravenous rehydration and placing athletes in the Trendelenburg position with oral fluids given freely. ▶ The time to discharge from the medical facility following EAPH after an endurance event is the same whether an athlete is given a large volume of intravenous fluid or is treated in the Trendelenburg position and given small volumes of oral fluids. ▶ These findings suggest that the cause of EAPH is not due to volume depletion (dehydration) but rather to venous pooling of blood in the lower limbs upon cessation of exercise.
. Medical coverage for middle-distance triathlons. Ann Sport Med 1987;3:111–12.
. Collapsed ultraendurance athlete: proposed mechanisms and an approach to management. Clin J Sport Med 1997;7:292–301.
. A 12-year profile of medical injury and illness for the Twin Cities Marathon. Med Sci Sports Exerc 2000;32:1549–55.
. Emergency medical cover for road races. Int Sportmed J 2003;4:1–13.
. The Boston Marathon medical care team: ten years of experience. Physician Sportsmed 1988;16:99–106.
. Emergency triage of collapsed endurance athletes: a stepwise approach to on-site treatment. Phys Sportsmed 2005;33:28–35.
. Diagnosis and prevention of hyponatremia at an ultradistance triathlon. Clin J Sport Med 2000;10:52–8.
. Reduced peripheral resistance and other factors in marathon collapse. Sports Med 2007;37:382–5.
. A modern classification of the exercise-related heat illnesses. J Sci Med Sport 2008;11:33–9.
. Signs and symptoms of heat exhaustion during strenuous exercise. Ann Sports Med 1987;3:182–8.
. Hyperthermia: new thoughts on an old problem. Phys Sportsmed 1989;17:97–113.
. Sacred cows and straw men. Phys Sportsmed 1991;13:24.
. The danger of an inadequate water intake during marathon running. S Afr Med J 1969;43:893–6.
. Exercise in the heat: old ideas, new dogmas. Int Sportmed J 2006;7:58–74.
. Dehydration during exercise: what are the real dangers? Clin J Sport Med 1995;5:123–8.
. Factors associated with collapse during and after ultramarathon footraces: a preliminary study. Phys Sportsmed 1988;16:86–94.
. Medical care at ultraendurance triathlons. Med Sci Sports Exerc 1989;21:S222–5.
. Exercise-associated collapse: postural hypotension, or something deadlier? Phys Sportsmed 2003;31:23–9.
. Intravenous fluids post marathon: when and why? Sports Med 2007;37:434–6.
. A guide to treating ironman triathletes at the finish line. Phys Sportsmed 2000;28:35–50.
. The collapsed athlete. Orthop Clin North Am 2002;33:471–8.
. Exercise related syncope, when it's not the heart. Clin Auton Res 2004;14(Suppl 1):25–36.
. Medical complications during the Ironman Triathlon World Championship 1981–1984. Ann Sports Med 1987;3:113–16.
. Impaired sympathetic vascular regulation in humans after acute dynamic exercise. J Physiol (Lond) 1996;495:279–88.
. Postexercise hypotension is mediated by reductions in sympathetic nerve activity. Am J Physiol 1999;276:H27–32.
. Mechanisms and clinical implications of post-exercise hypotension in humans. Exerc Sport Sci Rev 2001;29:65–70.
. Arterial baroreflex resetting mediates postexercise reductions in arterial pressure and heart rate. Am J Physiol 1998;275:H1627–34.
. Central blockade of vasopressin V(1) receptors attenuates postexercise hypotension. Am J Physiol Regul Integr Comp Physiol 2001;281:R375–80.
. H2-receptor-mediated vasodilation contributes to postexercise hypotension. J Appl Physiol 2006;100:67–75.
. H1 receptor-mediated vasodilatation contributes to postexercise hypotension. J Physiol (Lond) 2005;563:633–42.
. The prevalence and significance of post-exercise (postural) hypotension in ultramarathon runners. Med Sci Sports Exerc 1995;27:1595–601.
. Post-exertional orthostatic hypotension. Am J Med Sci 1947;213:641–54.
. Hemodynamic and autonomic changes induced by Ironman: prediction of competition time by blood pressure variability. J Appl Physiol 2005;99:1728–35. Funding This study was supported in part by funds from Discovery Health, the South African Medical Research Council (MRC) and the University of Cape Town Staff Research Fund. The final preparation of this study for publication was supported in part by the International Olympic Committee (IOC), research grant to the Clinical Sports Medicine Group of the UCT/MRC Research Unit for Exercise Science and Sports Medicine of the University of Cape Town. Ethics approval This study was conducted with the approval of the University of Cape Town Research Ethics Committee.